Registering or transferring a domain name is the first step, not the last and that is why it opens up many opportunities for you to work as people’s personal outlet and make money from home by serving your clients. Depending upon the type of the client you have, you can suggest him a business website, e-commerce store to start selling his products online to finally launch his own product app. A website is the first thing people look for after registering the domain name so here you can make your earnings either by helping them to start their website by training yourself with internet tutorials of SANGKRIT.net or simply take help from the other personal outlet by sending a mail to system@sangkrit.net so that you can focus on promoting your business to gain new clients and deliver the best service they deserve on time. 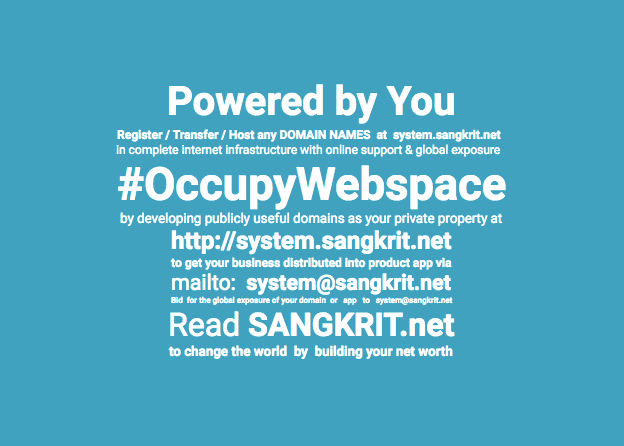 SANGKRIT.net gives you the freedom to deal with your clients yourself as it doesn’t offer any web development service or promotes any people’s personal outlet on its homepage though it connects any general outlet with the technical one on request to help him in completing his technical tasks better such as getting a web or app planned & programmed for the client. Internet Growth Engine provides complete internet infrastructure with homepage media to train you as people’s personal outlet so that you can independently start earning from your place by helping others in bringing their ideas online. So start helping people in understanding the importance of domain names and how a website or app is beneficial for their business. Also, try to connect with the people who already know the importance of web-app and are just waiting for a good deal.